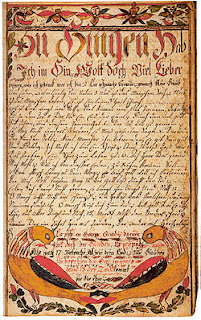 Clarissa’s quill scratched, looping letters with the same artistry she dedicated to her Frakturschriften, the ornamental breaking of letters in German script style. 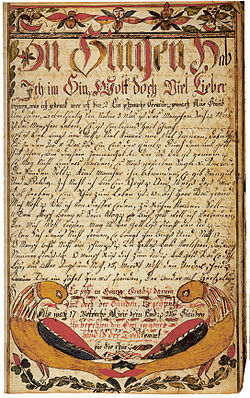 Drawings and special sayings, or Spruchbänder, accompanied the swirling text. The technique represented breaking the artist’s self-will. It had been all she could do to pinch her lips shut and not complain to John about being jostled those endless miles in the wagon with the groaning Pleasant while Rosina gleaned the facts about their destination Clarissa longed to learn. The unknown ahead mocked her. She had thought herself quite good at self-denial, but she’d begun to realize that the carefully ordered life of Salem had not tested her the way the unstructured wilderness would. 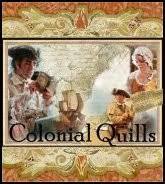 Clarissa shivered with the sense that her own fraktur, breaking, was only beginning. This glimpse into The Witness Tree, my novel releasing with Smitten Historical Romance this September, catches my heroine in a difficult time of transition. 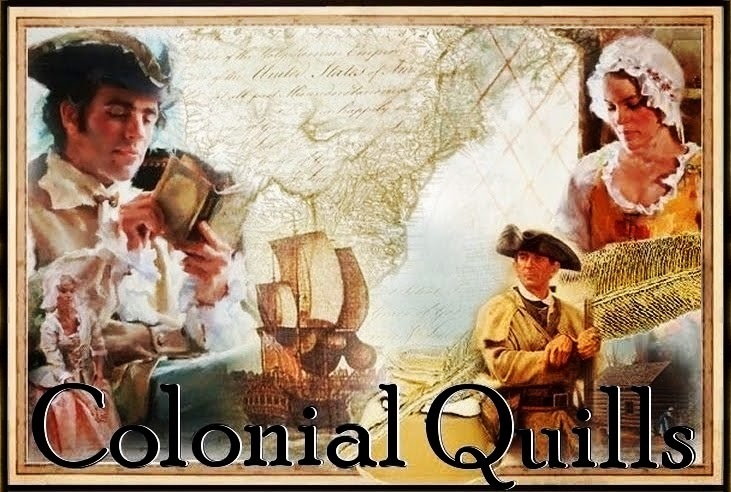 She’s just been joined to the brother of the man she wanted to wed in a marriage of convenience, and she’s on the long journey from the Moravian town of Salem, North Carolina, to Cherokee Territory. There, instead of exploring her beloved art, she’ll be teaching the children of chiefs. And expected to record their language, an assignment which could put her in danger. 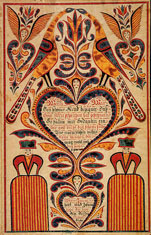 Germanic school teachers helped perpetuate fraktur folk art. While my research centered on Moravian fraktur, it was very common among Mennonites as well as Lutherans and Reformed Pennsylvania Germans. Very interesting Denise. They are very colorful and must have taken some time to complete. How beautiful and interesting. Thank you for sharing.